Is your roof showing unsightly signs of mold, fungus, or staining? Roof top organisms such as mildew, algae, molds, bacteria, lichens, and mosses are common culprits behind decomposing roofs and ultimately compromise the integrity of your roofing system. History: What causes the stains on my roof? Shingles contain limestone. The manufacturers started using limestone as filler in their shingles to help offset the rising cost of asphalt. If you have done any gardening or fertilizing, you know that lime is used to help feed, nourish and grow things like grass and other vegetation. Well, the shingles have a UV protective coating on them when they come from the manufacturer,but once that coating starts to wear off, the limestone is exposed and now the mold spores that are in the air start implanting on the roof and feeding off the limestone. You are actually “fertilizing” the mold on your roof and you’re watching that mold deteriorate, decompose and decay right in front of you. Other organisms that grow and stain your roof besides mold include: moss, algae, lichen and bacteria. If these organisms have proliferated on your roof, they may now be visible to the human eye. The good news is that the Carmel roofers at Honey-Do-Men Gutters & Roofers can safely and effectively remove this unsightly rooftop menace! While homeowners know that mildew is not pretty, often they don’t realize that what’s growing on their roof is actually causing damage. Organisms that grow on wood, concrete, siding, aluminum and other surfaces create acids that break down construction materials that lead to cracking, shingle curling, and other forms of decay. If left untreated, the algae/mold will eat away at your roofing shingles, causing leaks. 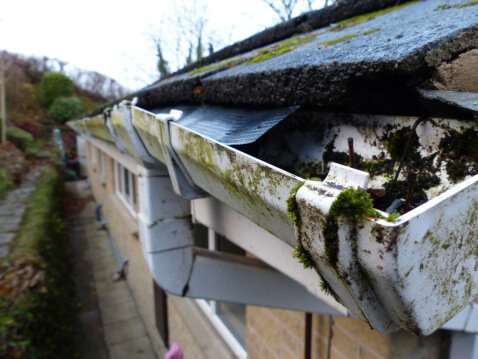 If left untreated, it can cut the life of your roof in half. You can lose your homeowners insurance, get canceled, not be renewed, or not get it at all. We can make your existing roof look like new again for just a fraction of the cost of a brand new roof, saving you thousands of dollars! Some companies use a “surface cleaner” which is a machine that connects to a pressure washer and looks like a floor buffer. This aggressive method is not recommended by manufacturers and can dislodge roofing granules. There is a better method of treating roof mold called non-pressure roof cleaning, which is favored by roof shingle manufacturers since it is gentler on roofs. It uses a detergent of sodium hypochlorite, a biodegradable substance. As a homeowner or building owner, you don’t want to get just 50% of the fully duty cycle of your roofing system; premature roof failure can cost you a fortune! Home and building owners should look at roof cleaning as necessary preventative maintenance for their roofing system. There are two different ways. One is power washing, which is just what it sounds like, a pressurized water system run through a gas powered machine that blasts off and strips away dirt, grease, grim, mold, moss, mildew, algae and lichen. The problem with power washing is that it doesn’t actually kill anything and nothing is done to try and protect the house from the algae growing back. Damage wood by stripping it of its natural oils, causing it to dry and splinter. Strip the color off vinyl and aluminum, leaving it streaky and looking sun-bleached. Strip the UV coating off the shingles, causing it to wear out prematurely. Strips away the graduals from your roof tiles, exposing the fiberglass matting. Cause leaks in the roof as the water is shot up the roof under the shingles. Cause leaks in the siding as water is shot up into the soffits and then runs down the interior walls, between the seams of the siding and strips the caulking off the windows. Your other option is called Bio-Washing. Bio-Washing offers a better quality job that lasts longer and gives you better results without damaging the siding or the roof. It leaves behind a protective film, keeping the house looking cleaner longer. Kills the mold, moss, lichen, algae and bacteria while also removing the dust, dirt, and grime. Uses little to no pressure, almost like a mist. Runs off a car battery and solar-powered fuel cells. Has no gas-powered engines so it’s quiet and doesn’t smell. Uses an EPA-approved cleaning agent that kills mold, moss, lichen, algae, mildew and bacteria. Leaves behind a clear coat protective film that keeps algae and other bacterias from growing back. There are no power washers, gas operated machinery, buffing machines, disc scrubbers or scraping of any kind. All these processes can damage your home, strip graduals off your roof, strip the UV coating off shingles, void the roof warranty, cause leaks, and cut the life expectancy of your roof in half. This is why I don’t recommend any of them. We come to your house with a 100-gallon tank on the back of our truck, mix an eco-friendly, EPA-approved cleaning solution, adjusting the mixture for the surfaces we are working on to both kill the mold, moss, lichen, mildew and bacteria and also clean and remove the ugly stains and streaks on your roof. The solution is pumped up on to the roof using a car battery which is charged using solar cells. Then we spray a mist of the solution, getting the surface wet, and then let the solution do the rest of the work. The chemical is absorbed into the algae, killing it and turning it white. The dead algae then falls off naturally with the rain water over the course of the next 45 days, leaving behind a protective clear coat film that you wouldn’t have if you were trying to scrape, scrub, strip or power wash off. What Else Can You Clean with Bio-Washing? We also do commercial and multi-unit services. Say goodbye to algae and fungus! Roof cleaning is one of the best things you can do to maintain and extend the life of your roofing system. To learn more about the benefits of this service, contact our office to schedule an appointment with one of our highly-trained and friendly roofers!